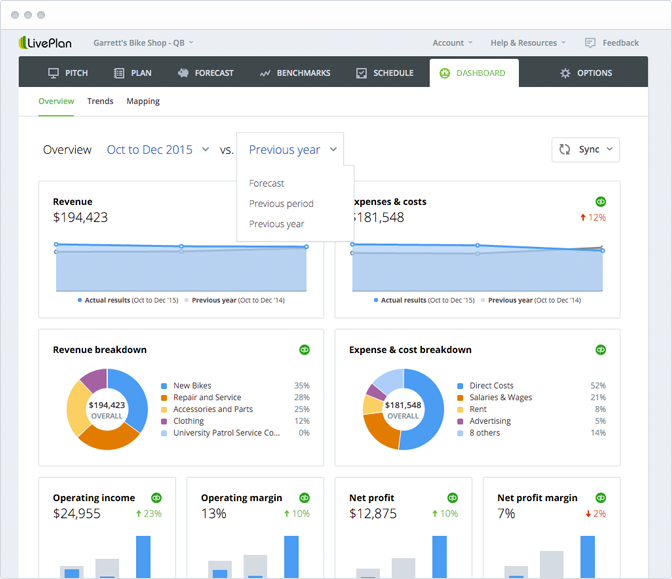 LivePlan now provides business owners with unmatched insight into their financial performance. The LivePlan Dashboard looks at actual financials, compares to their forecasted numbers, and identifies just how well a business is doing, where it is exceeding expectations, and where there is room for improvement. Palo Alto Software announced today its official launch of the LivePlan Dashboard. The Dashboard feature revolutionizes financial management for small business. For the first time, small business owners can put together a budget and forecast, and then automatically bring in their actual financial results to understand exactly how their business is doing. The Dashboard automatically compares actual financial results to planned and past results to give the business owner valuable insight and help understand which levers to move to grow their business, remain cash flow positive, and understand their key performance indicators. The Dashboard empowers users to quickly and easily maximize profit centers within their business; identify and correct loss centers; and adjust payables and receivables (e.g., payment schedules, contract terms) in order to improve their business’ overall financial performance. Track business ups and downs and know exactly what to do to keep growing and bringing in profits. Gain clear insight with alerts for overspending or low cash balances. Connect directly to QuickBooks, or bring in their own financial data, to immediately see how their business is doing, anytime from any computer.